This page supports specialist and non-specialist teachers, providing background information about concepts and research stories or narratives underpinning the My Food My Future learning and teaching resources. Foods contain macronutrients, which provide humans with energy, needed for growth, repair, metabolism and physiological functions. The three macronutrients required in large amounts are proteins, carbohydrates, and fats. Carbohydrates are the major energy source for humans and should make up the greatest proportion of food intake. They are found in starchy vegetables, grains, fruit and nuts. Proteins enable growth and repair of tissues. They are found in animal products such as meat, eggs and milk as well as plant based foods such as nuts and legumes (beans, lentils, etc). Fats and oils are an essential component of a balanced diet. Fats are required for maintaining cell membranes, absorbing vitamins, and providing energy. Most fats obtained from animals are saturated fats, whereas plants provide mainly unsaturated fats. Micronutrients, vitamins and minerals, are also essential components of a balanced diet, required in smaller quantities to enable essential metabolic and physiological processes to occur. Food labelling in New Zealand is determined by Food Standards Australia New Zealand (FSANZ). All ingredients used in a food product must be listed on the back of the package, along with a Nutrition Information Panel. In addition to the Nutrition Information Panel, Front of Pack Labelling provides easily-interpreted nutrition information, which could help consumers identify healthier food options. Although it is currently unknown whether front of pack labelling affects food choices and consumer purchasing behaviours, research currently being conducted at the University of Auckland is seeking to identify the most effective ways to help New Zealanders make healthier food choices. 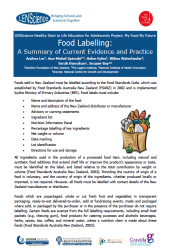 Below is a teacher resource that outlines current and proposed food labelling practices in New Zealand and research evidence that has been used to determine policy and practice for food labelling.